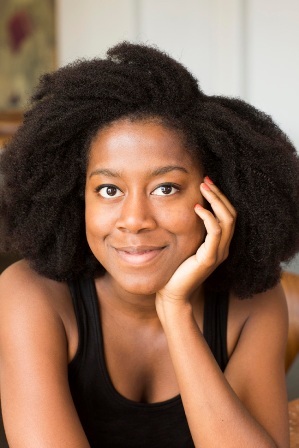 Based on the press image provided by book publisher Henry Holt and Company, author Tomi Adeyemi the 24-year old Nigerian-American author of “Children of Blood and Bone” favors natural hair. In the photograph, she’s smiling but not in a cheesy and staged manner that is often favored (or forced upon) by authors. You know that cliched press image, the one that suggests that perhaps the author wants to shout to the viewer—“I am an intellectual so take me seriously—dam it—”. That’s not the case with Adeyemi's image. If you look closely there is something in her eyes that makes her look like she’s holding a great, big, juicy, earth-shattering secret and one that will be spilled by no one but Tomi Adeyemi. Adeyemi's “The Children of Blood at Bone” is set in the magical land of Orïsha and is told through the eyes of a young woman named Zélie who goes on a quest to restore magic to her people. It’s a dark time for Zélie’s people with magic being banned from the land. Prior to the events detailed in the book, Orïsha had been home to powerful maji, those individuals blessed by the gods with supernatural powers. Terrified by the unknown, an evil king outlawed magic and destroyed most of the maji. After having a chance run-in with Amari, a runaway princess who might hold the key to restoring magic, Zélie and her brother Tzain begin an action-packed journey that takes them all the way across Orïsha. On her recent press book tour, Adeyemi's team found exactly 12 minutes for us to chat, via phone. I don’t want to sound bitter, I am not. I am respectful of time, it is a precious element and unless you are one of the maji you can’t stop, rewind or fast-forward time—unless, again you are blessed by the gods. Adeyemi is the middle child of three with a brother and younger sister. Her father is a doctor, and in Chicago, her mother runs a group of hospices. Adeyemi studied English literature at Harvard before traveling to Brazil on a fellowship to immersive herself into West African culture and mythology. It was in South America that the seeds of Children of Blood and Bone, the first in a trilogy, were sown. There are ten clans inside the Maji society. IKU clan are the reapers, and their deity is Oya. EMI clan are the connectors, and their deity is Ori. OMI clan are the tiders (water) and their deity is Yemoja. INA clan are burners (fire) and their deity is Sango. Afefe clan is are winders (air) and their diety is Ayao. Aiye clan are grounder+welder (iron and earth) and their deity is Ogun. Imole clan is described as darkness and light, and their deity Ochumare. Iwosan clan are healers+cancer, their deity is Babaluaye. Ariran clan are seers, maji of time and their deity is Orunmila. Eranko clan are tamers (animals) and their deity is Oxosi. Strolling the wide streets of Harlem, I chatted with Adeyemi and this is what she has to say about what inspired Zélie's world and why she hopes that young girls, all over the world will read her book and connect with the spirit of the story. It’s almost a safe bet to say that her wish will come true, since along with the critical accolades for the debut novel, Adeyemi also landed a three-book and three-movie deal with an all-Black cast of characters. Impressive. L.A. Watts Times (LAWT): I have 12 minutes. Question one — 24 is mad young. Congratulations, you are blowing up. Your thoughts on this? LAWT: In reading this book and learning more about the ten maji clans, I could not help but think this reminds me of today, circa 2018 and how America snatched language, culture, religion, and tradition from the Africans that they enslaved. Dare I say it, they tried to destroy our magic. Thoughts? LAWT: It’s an adventure and graphic. The lead character, Zélie’ is a warrior and in the first chapter entitled —Zélie — we get a taste of it. It’s all I can do not to scream I dig my nails into the marula oak of my staff and squeeze to keep from fidgeting. Beads of sweat drip down my back, but I can’t tell if it’s from the dawn’s early heat or from my heart slamming against my chest. Moon after moon I’ve been passed over. LAWT: It’s exciting knowing that your books will have a life on the big screen. The success of Marvel’s “Black Panther” has Hollywood in a mad dash to find the “next” voice, and we both know if it’s not with a Black film director the folks won’t support it — and nor should we. LAWT: When did you know that you had found your career? LAWT: What’s next? Silly question but I must ask it. TA: The sequel to “The Children of Blood at Bone”! And after that, the final book in the trilogy! But I do have a few secret projects but for now…. LAWT: …but for now, they will remain a secret.